This 13-story, 491-room hotel trails along 1,200 feet of beach on the Atlantic Ocean at roughly the midpoint of the island and a short drive from Crandon Park, site of the annual Miami Open each spring. The resort takes its architectural clues from the Colonial West Indies, but the comfort and very attentive service are all Ritz-Carlton in marble baths, feather beds, down comforters, and Frette linens. Among its amenities are a 20,000-square-foot spa, five restaurants and lounges, and an oceanfront Ritz Kids pavilion with a children's-only pool and oceanfront playground. But the most significant amenity from the point of view of tennis players is the 11-court facility designed by former touring pro and noted television commentator Cliff Drysdale. Tennis Staff. Cliff Drysdale Tennis manages the club's operation and installed Max Mangones as director. Originally from Haiti, Mangones came to the U.S. at age 15 and went on to play Division II college tennis at Miami's Barry University. He heads of a staff of as many as 10 international pros in season, catering both to the needs of active local members and to those of guests. Tennis Programs. The weekly roster includes a 90-minute clinic every day, supplemented by three more on Monday, Wednesday, and Friday evenings. Two things distinguish these clinics: the large turnout (often 20 or more people) and their lively and challenging organization. Although mine began, as clinics often do, with work on forehands and backhands, it quickly moved to live-ball drills in a variety of formats as we players rotated through half a dozen pros. As a hotel guest these afford an immediate introduction to some of the local players, though if you prefer playing to drilling the staff can draw on that same stable to set up matches. Finally, from early June to late August, the Tennis Center adds a summer day camp for juniors ages 7-16. Clinics aside, there are a number of special events scattered throughout the year, including ladies' retreats, social round robins, and, just prior to the Miami Open, an All-Star Charity Event with the likes of Serena Williams, Novak Djokovic, Andy Murray, and Genie Bouchard, and commentary by Cliff Drysdale. Courts & Fees. Court fees: $15/day and includes a can of balls. Golf Courses. The resort has no golf course of its own but guests can play at the highly rated public course in nearby Crandon Park. Spa & Fitness Center. A 20,000-square-foot spa and fitness center with 21 treatment rooms overlooks the Atlantic Ocean. Its treatments draw on the local history of the Tequesta Indians, explorers, and coconut plantations for ingredients and inspirtation, whether that's a coconut nourishment to soothe the skin or a detoxifying ceremony to purify and restore balance. The Fitness Center has an array of TechnoGym equipment, its cardio elements facing windows with views of the foliage outdoors. It also hosts a selection of classes that include boot camp workouts, Pilates, yoga, cycling, and stretching. And ... There are two outdoor pools, one for adults only, the other a large amoeba-shaped zero-entry expanse bordered by lounge chairs. The Ritz Kids program provides supervised activities for those ages 5 to 12 in partnership with Jean-Michel Cousteau’s Ocean Futures Society. Not mere babysitting, it instead seeks to exploit children's natural curiosity as a way of introducing them to the natural wonders and culture. It's based at the tennis center. There are several tasty options: contemporary American cuisine at the Fountain Cafe, a selection of tequilas and Mexican fare at the oceanfront Cantina Beach, and gourmet burgers and international appetizers at Dune Burgers on the Beach. In addition, Light Keepers is about to open and will focus on coastal cuisine. Join Retreat director Scott Colebourne and his professional staff for this 5-day/4-night, ladies-only tennis retreat. The package bundles hotel accommodations with 15 hours of instruction and drills, coached team competition and match play, daily breakfast, a welcome reception, a players' party (with an awards presentation and video show), and optional spa services. For more information, visit Cliff Drysdale Ladies Tennis Retreat or phone: 830-625-5911, ext 208 or email: . There are 402 rooms altogether, 37 of them suites. All have terraces that overlook the ocean, bay or gardens. 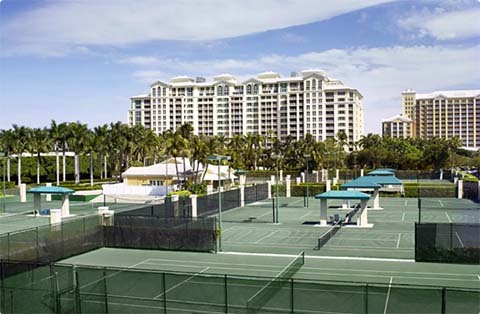 The tennis package below includes deluxe accommodations, unlimited all day court time, daily buffet breakfast and access to the fitness center. Seasons. Year-round, though hot and steamy in summer. Travel Instructions. By Air: The Ritz is roughly 17 miles from Miami International Airport (MIA), which is served by all the major airlines. General Tourist Information. Visit the Greater Miami Convention & Visitors Bureau website or phone toll-free 800-933-8448.